How much do we know for certain about the life of Sacagawea? The answer is: almost nothing. She was born "around 1788." She was abducted by the Hidatsa "when she was about twelve." The date of her death is similarly uncertain: the prevailing view is that she died in 1812 at Fort Manuel Lisa on the Missouri, but others contend that she lived well into her 90s and died at the Wind River Reservation in 1884. Even the pronunciation and meaning of her name are still disputed, a reflection of the unknowable transliteration that both Clark and Lewis tried to capture in written syllables. The most reliable primary documents that have come down to us concerning Sacagawea are, of course, the journals of Meriwether Lewis and William Clark, through which she has entered the public imagination as an improbable but key player on the stage of American history. But even the journals, famed as they are, give us only fleeting glimpses of this young woman. She was one of Toussaint Charbonneau's several "squaws", a usage that covered everything from absolute servitude to common law marriage. In historical accounts, she is most frequently described as his "wife", but the fact remains that we have no way of knowing the human contours of their relationship. The instances of her mentions in the journals are themselves full of dramatic details: a difficult labor for her first child, Jean-Baptiste Charbonneau, born on February 11, 1805 in the bitter cold far-northern reaches of the Upper Missouri; her dire illness and near death in June of that year, when Lewis dosed her attentively from his meager medicine kit; her vote as an equal member of the expedition about the location of their winter camp once they reached the Pacific; her insistence at being allowed to accompany the party dispatched by Clark to the shore of the Pacific to investigate what meat might be recovered from a beached whale. All of these scenes have survived in the clear and dispassionate prose of the two captains, and while they offer tantalizing glimpses of how Sacagawea reacted under pressure, they of course come from the pens of those whose business it was to give the expedition shape in daily journals. While history is indeed written by the conquerors, perhaps here it would be more apt to say that history is first written by those who can write. How would she have described the captains? 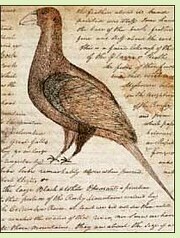 Nothing certain remains from Sacagawea's oral tradition, so the accounts of those whose language included an alphabet were bound to prevail. Even so, the degree to which the slender and infrequent mentions of Sacagawea in the Lewis and Clark journals have subsequently been weighed down with meaning is astounding. Beginning in the late nineteenth century, and gathering steam well into the twentieth, there developed an elaborate literature of wonder, almost of awe, around her being. She has come to represent resilience, courage, patience, loving motherhood, feminine independence . . . the list is virtually endless. It has been said that more images of her adorn public places than that of any other American woman. 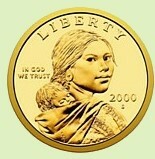 The latest iteration of her imagined likeness, the young mother bearing her papoose who graces the U.S. dollar coin, is as close as American culture is ever likely to come to an indigenous Madonna and Child. And yet most of this is pure fabrication, a projection of our own changing needs and perceptions of the past. I am reminded of the elaborate hagiography that has built up in France around Joan of Arc, just enough of it based on the startling and dramatic facts of her life to lay the groundwork for a complete mythology. In that sense, Lewis and Clark is our own founding myth, and the individual actors in its story assume the proportions of legend as we embroider the fragile facts we have with our own imaginings. Sacagawea dances around the edges of the narrative: innocent, strong, pure of heart, and ultimately unknowable, an undying receptacle for our dreams about both past and future. The beaten and abducted young squaw stands alongside the mother of a mixed-race son, the determined woman who saved Lewis and Clark from failure by bargaining for horses with the tribe from which she had been torn. Could any refracted image we fashion to express our hopes be more ambiguous, or more captivating? Thad Carhart, author of Across the Endless River, is a dual citizen of the United States and Ireland. He lives in Paris with his wife, the photographer Simo Neri, and their two children. For more information, please visit www.thadcarhart.com.